A square rod with axis-aligned segments in the topology of a figure-8 knot. This is a piecewise linear, axis-aligned figure-8 knot path that is tightly packed into a 4x4x4 grid space. 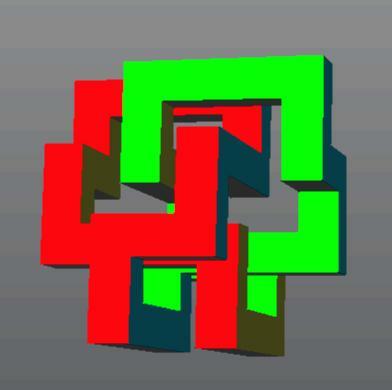 The path was generated by hand, and the prismatic shape around it was generated by the program "ugworm." This part was specifically designed to test the feature detection capability of some of the CyberCut software for fabrication of this part on a 3-axis milling machine. This experiment is part of a research program sponsored by NSF to streamline the process of rapid prototyping of free form parts, by defining a clean interface between designers and fabricators. The orientation, scale or strength of this model is not critical; it can be scaled so as to fit optimally a particular process or some remaining space in a run of a larger piece. 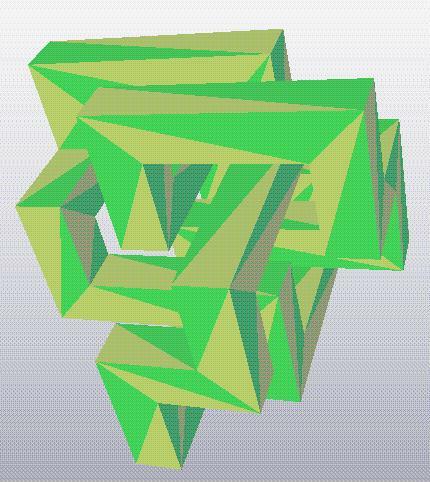 The .STL files describe a part that fits into a cube 7 units wide. When implementing this shape with an SLS process, one might consider a process variant that solidifies the surface only in order to reduce the amount of fusing that has to be done. Berkeley UniGrafix description of the knot (rf8kh4.ug). ACIS script description of the knot (rf8kh4.acis). The rf8kh4.stl.gz file can be uncompressed with gunzip.